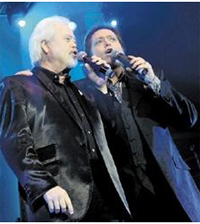 THE Osmonds are bringing the curtain down on their touring career with an Up Close And Personal Final Tour. At Aberdeen’s Music Hall, brothers Jimmy, Merrill and Jay took the chance to say thank you to the fans by playing a string of hits from more than 50 years in showbiz. They bowed out with Crazy Horses while Jimmy waved a Saltire, and as The Osmonds left the stage Merrill shouted “we will never forget you ... thank you” – a sentiment shared by everyone at this special gig.